Outdoor lighting is an excellent investment in your home or business. Think about it. You have spent time and money making the exterior of your property look beautiful. You’ve painted your home, spruced up your landscaping, and carefully cared for all the plants. But if you lack outdoor lighting, you are only getting half of the value of all that hard work. Why let your work disappear at night? Landscape and exterior lighting is a natural choice to let your home or business looks it’s best all day and night. But before you start planning out your design, there are some outdoor lighting terms to know. Outdoor lighting has a lot of terms to know. But don’t be intimidated. Really, we just want you to be familiar with the different types of lighting. There are so many great ways to light your home or business. So let’s go over a few of our favorite options. We hope that by the end you will be not just more knowledgeable, but more inspired! This type of lighting is basically what it sounds like. Lights are placed on the ground or at the base of a structure and pointed upwards. Usually, this is done with bullet lights, narrow-angle lights great for highlighting a specific feature. One common use of up-lighting is for lighting trees. If you have a particularly interesting tree, place two lights about 8-10 feet from the base of the tree, coming from opposite angles. The lights will illuminate the trunk and the underside of the canopy. Having two lights prevents deep, stark shadows. 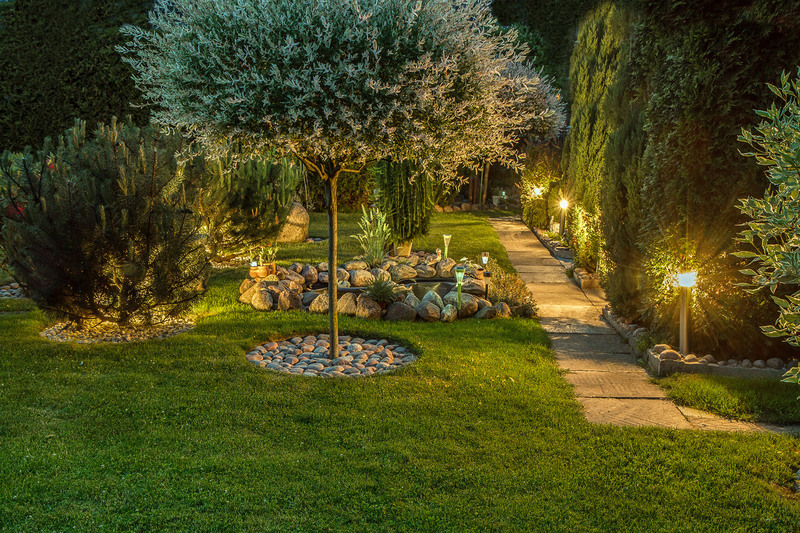 This is an appealing technique for residential landscape lighting. Everyone loves the feel of sitting outside on a moonlit night under a silvery full moon. Of course, the moon isn’t always full, and the skies aren’t always clear. So we have artificial moonlighting to create the effect of moonlight all night long, every night. To create this effect, lights are placed high up in trees or on a tall structure. The wide-angle lights are placed in special fixtures that minimize glare and focus the light downward. This prevents the appearance of a glowing tree canopy. To complete the effect, use bulbs in the 4000K range. That is bluer than the usual 3000K used for most outdoor lighting. It gives the effect of what we think of as “silvery” moonlight. Read our post all about artificial moonlight here. This effect is great for highlighting unique shapes, like an interesting tree or garden feature. To create this effect, it is necessary to have some structure that will serve as the backdrop. A wide-angle light is placed between the object to be silhouetted and the structure. A spread light can shine light in two directions, toward the structure and the feature. You can also use two wash lights; one pointed toward the structure and the other toward the feature. When light comes from behind the feature and the wall behind them is light with a gentle wash, you can see sharp silhouettes. This is the opposite of silhouetting. Instead of placing the light between the feature and the structure, the light is placed in front of the feature facing toward the structure. This creates deep shadows on the structure. It is a great way to generate interest and depth on a large, flat wall. If your feature is a tree or something that will move in a breeze, this is an especially appealing effect. This is a great way to highlight stonework or other exciting texture. To create this effect, lights are placed at the base of a wall, very near to it, and shined upward. The light grazes the wall and creates shadows the accentuate the texture of the wall. This is an excellent effect for large walls, pilasters, or low walls used in hardscaping. This is one of the most essential pieces of outdoor lighting. Whether you are lighting your home or your business, people need to be able to see to get around. Path lights are first and foremost to help people see where they are stepping and to avoid obstacles. However, path lighting should also be a design element. Unlight many lighting fixtures, path lighting fixtures are almost always highly visible. So choose a style that complements your home or business. To learn more about path lighting, try this blog post . This is less a specific type of lighting than a technique used with many types of lighting. Cross lighting just means lighting from opposite angles. This prevents deep shadows from forming on the side opposite the light. It is very useful for lighting many features, or for wash lighting your home’s or business’ facade. But be careful not to overdo it. Shadows should be thoughtfully included in your design. Erasing all shadows with cross lighting would make your design look too bright, flat, and uninteresting. This is great for highlighting a particular feature in your landscape. It can be used for a flagpole, garden art, or a water feature, for example. In a commercial setting, it may be used for a sign you want everyone to see. This technique is often used in combination about cross lighting for larger features. Down-lighting is a great way to light a large area. Patios, entrance ways, decks, and seating areas can all benefit from down-lighting placed high up on a structure or in a tree. Downlighting can also be used close to a structure in a way similar to grazing. This is great for lighting pillars and other vertical structures, or even as an alternate way to highlight textures. This is a slightly more subtle type of down-lighting. When you have hardscape features like walls, fireplaces, or benches, you can install small lights under a rim or lip of the structure. This will highlight the texture and make the feature stand out. It also provides a little extra light to make it easier to find your way around the hardscaping. This includes lighting around the outside of your pool as well as the lighting in your pool. Lighting in your pool should really be done by someone who has particular skill in underwater pool lighting. For the area around your pool, you can get a little creative. This is a fun area of your home. Well lights are great for the deck area around the edge of your pool. They provide light and make the edge of the pool highly visible, an important safety feature. Because they are installed flush with the ground, there is no tripping hazard. This is somewhat different than pool lighting. Underwater lighting is for water features like fountains, ponds, or even birdbaths. At night, a body of water can disappear or look very flat. Adding some lighting from below the surface of the water can add depth. The effect of the water spreading the light around can also be a design feature. In some cases, you can even use colored lights for a fanciful glow. Just be judicious with your use of color, or your water features will start to look like a Vegas hotel. Wash lighting creates a backdrop for any other lighting you will have on a structure. It’s a wide-angle floodlight that gives a soft glow to the facade of your home or business. It prevents deep shadows and makes sure that your more directed lights don’t end up looking like a patchwork of light in a sea of dark. It can also be used for hedges, low walls, or other features with a lot of surface area. We hope that this rundown of lighting terms has informed and inspired you. If you’re ready to try some of these effects, contact us to schedule your free consultation. We are happy to talk about how we can best use these techniques on your home or business.